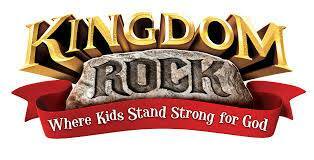 Kingdom Rock – Where Kids Stand Strong For God | Nan Tubre Writes . 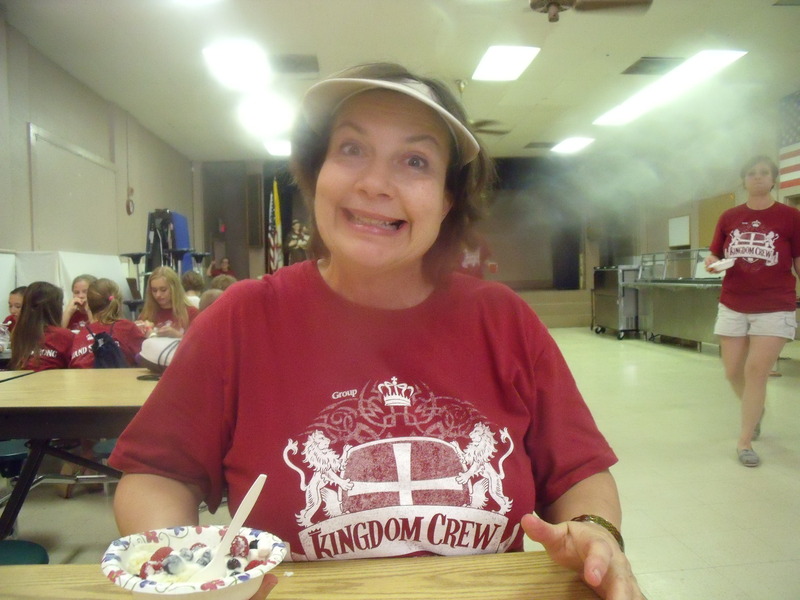 . .
Well, Vacation Bible School is over, folks, and the baby grands have gone home. I think I have caught my breath, and I have to say, I really enjoyed the week. The program was awesome, beyond awesome actually. There were glitches, but I’ll get to that in a minute. 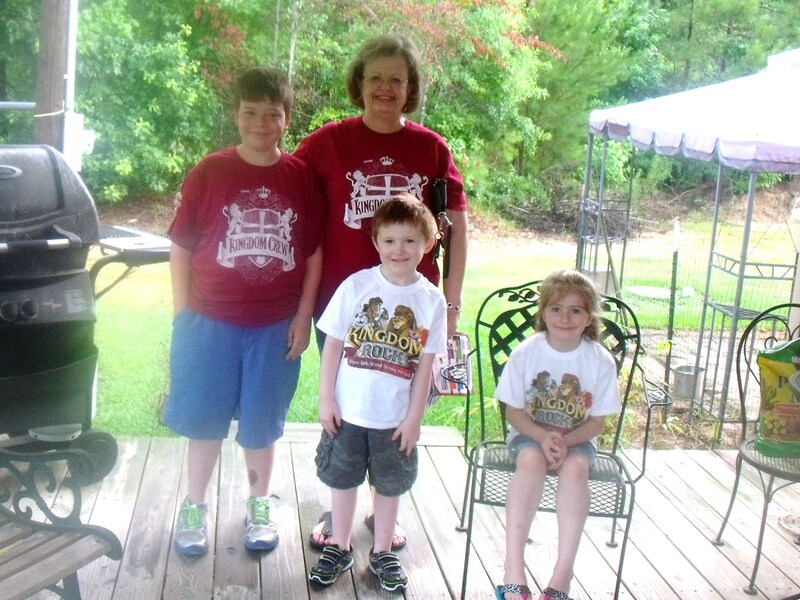 This is a picture of us just before leaving for the first day of VBS. The kids were very excited and so was I. Not really. I was nervous. I always am just before something big. Every year I get to be the Station Leader that shows movie clips of Chadder Chipmunk on his journey to live for God. You would think by this time I would be a pro at it. Nope. I always manage to screw something up. God knows this and mercifully sends someone to help me at just the right time. Poor me. It’s so embarrassing. But it does keep me from letting the title of Station Leader go to my head. You know I’m kidding, right? We are blessed to have an awesome DRE (Director of Religious Education) at St. Anthony of Padua Catholic Church in Bunkie, Louisiana. Her name is Karen McCoy which is a synonym for ‘burning ball of energy’. Neither the adult volunteers, nor the student volunteers can keep up with her. She had so much to do in so little time. She began preparations weeks before the program start date and it just seemed like every day something new was added to the list of things to do. I doubt any of the children that came to VBS, or their parents, know what goes on behind the scenes and how hard it is to put this kind of program together. Karen McCoy, DRE at St. Anthony of Padua Catholic Church, Bunkie, Louisiana. Can you tell this is after the last day? But Karen knows very well how hard it is. So do I and all of the volunteers who helped where we could. There was never enough people involved, or so it seemed. Let me just say this: we painted, colored, cut, hammered, pasted, stapled, taped, and zip-tied everything by hand. We had to create the stage props, décor for all the rooms, costumes, and paint, paint, paint. For days we painted cardboard to look like castle walls. It was so hot outside (the only place we could paint), the wax in my ears melted. Whew! I’m glad I wasn’t responsible for everything that goes into the program but at the same time, I feel guilty that I couldn’t do more to take a load off Karen. How she did it I’ll never know. Her responsibilities were endless. It’s mind-boggling to think about. She started weeks before we did. Can you imagine that? There were some less than ideal moments during the week, the glitches I mentioned earlier. A few crew leaders couldn’t finish the week. One or two were absent altogether, sound systems and lap tops gave up on us, the stage props melted, some kids couldn’t register until the very last minute. But we had good leadership and no one knew there was any behind-the-scenes chaos. Everything fell into place. I know Who to thank for that and I praise Him for the honor to serve Him by serving our children. He is a good God. His mercies are true. He said to bring the children unto Him. So we did, and so it goes every year in the summer time. Karen McCoy has dedicated her life to young people and works hard to Stand Strong For God. Let me say also that it is a thrill to work with some of the special volunteers who always show up when God says go. Ashley, Rachael, Claire, Agnes, Jill, the Youth Group. There are more, but names allude me at the moment, so I hope they forgive me for not mentioning them. I wish I could post a picture of the 60+ children in the group but I hesitate to do that without parental permission. Suffice it to say, it was a big, loud, rowdy, happy, laughing-out-loud group of kids and adults. Praise God! I don’t know about anybody else, but it has taken this long for me to rest up. I was simply exhausted! I haven’t had to go anywhere or do anything extra since the last day of VBS. Ha! That reminds me of the post-surgical advice I got from a doctor one time. “Don’t do anything you don’t want to.” Wise man. What a blessing! All of my grandchildren told me they couldn’t wait till next year for another VBS! If that’s not a testament to hard work, blood, sweat, and tears, what is? Mission complete. And don’t forget to pray for peace, ya’ll. Your grand babies have grown up so much. That is great your church does VBS. I am not sure many Catholic churches do it any more. I know St. Francis (the parish I belong to a long time ago when I was involved in RE. And there is a lot that goes on in the background – oh I remember those days. And now I am finding out all that goes on in the background at the library with the volunteers and now with the teen volunteers…. lots and lots and lots of paperwork. Thanks for sharing your awesome week. And thanks for sharing your love of God with us.